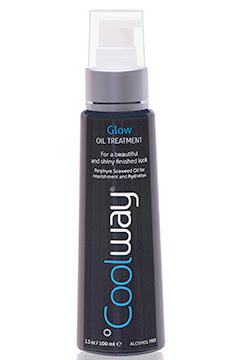 "Perfect your °Coolway style with a runway-ready Glow! Ordinary finishing oils are designed to add vibrancy back into hair but often contain Sulfates, Parabens, Alcohol and other ingredients that can make hair dull, dry, and faded. °Coolway’s Glow Treatment™ contains none of these harmful components. It combines a natural and nutrient-rich formula of Vitamin E and Porphyra Seaweed extract to maintain moisture and balance so your hair remains beautiful and shiny throughout the day. " To start off, this product smells amazing! I have a slight problem with frizz and flyways especially with my bangs and overall my hair looks dull/flat after I've washed it. My hair is very long and fine, but I have lots of it and the use of most oil products, or shine sprays can easily make my hair look really flat and feel greasy. I can't use most conditioners because they often tend to weigh my hair down and make it heavy and greasy. This oil is great, it's lightweight, smells great, and gives my hair a really pretty shine that never looks oily, greasy or gross. I'm a definitely a fan! I use it every time I blow dry and style even if I'm not planning to style my hair I use it as a leave in. Overall, I would highly recommend this oil for any hair type, but especially for fine or thin hair.